Late season apricot with tremendous flavor. Ripens in the first two weeks of August. Fruit is medium sized with good color. One of the highest-scoring apricot varieties at Dave Wilson Nursery fruit tastings. Estimated chill requirement: 500 hours or less. All-purpose freestone, sweet, aromatic, flavorful. Long-time No.1 apricot in California. Early bloom. Late June harvest in Central Calif. Estimated chill requirement: 400 hours or less. Self-fruitful. One of the earliest fruits of the year (ripens during cherry season - late May/early June in Central Calif.). Heavy crops of extremely large, sweet/tart, flavorful fruit. Estimated chill requirement: 500 hours or less. Self-fruitful. (Zaiger). Small golden apricot that is very sweet and fulfilling. Can be self-Fertile but planting two varieties is recommended for a better crop. From Canada. Frost hardy late bloom. Resists brown rot and perennial canker. Medium to large fruit ripens early to mid-June in Central Calif. Sweet, juicy, rich flavor - one of the best. 700 hours. Self-fruitful. Late-blooming, productive tree, proven in coastal Northwestern climates. Medium size, bright orange fruit sometimes blushed red. Orange freestone flesh is firm, sweet, flavorful. Resistant to perennial canker and brown rot, resists cracking. Originated in Ontario, Canada. Introduced in 1982. 800 hours. Self-fruitful. 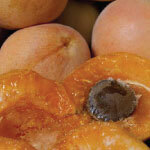 Long-time favorite of apricot fanciers for its exceptionally rich flavor and aroma. Reliable producer. Used fresh and for canning. 600 hours. Self-fruitful. Large, flavorful yellow freestone. Attractive orange skin blushed with red. Ripens mid-June in central California, 1 to 2 weeks before Blenheim. Vigorous, productive tree Originated in Ontario, California & introduced in 1956. Estimated chill requirement: 500 hours or less. Self-fruitful. Large, beautiful orange fruit with very intense flavor. Ripens in early June. 400-600 hours. Self-fruitful. Reliable, heavy-bearing commercial variety, Very firm, medium-sized fruit suited to canning, drying or fresh use. Estimated chilling requirement 600 hours. Self-fruitful. Proven producer of large, flavorful fruit in Western Washington. Recommended for other western climates where spring rains and frosts limit apricot culture. Harvest early August. 600 hours (estimate) Self-fruitful. No. 1 apricot for canning, excellent fresh or dried as well. Medium to large, firm, rich flavor - one of the best. Widely adapted. Early July in Central Calif. 600 hours. Self-fruitful. The most consistently productive apricot variety at Dave Wilson Nursery 1992-97. Large, orange fruit with firm, sweet flesh. Early harvest, 2-3 weeks before Wenatchee Moorpark. Originated at Prosser, WA, introduced in 1989. Estimated chill requirement: 500 hours or less. Partly self-fruitful; biggest crops if cross-pollenized by another apricot.